Renowned for its unparalleled Faculty and for offering a diverse array of dance disciplines under one roof, BDC has earned a reputation in the global dance community as a beacon of excellence in dance education. More than 30 years of experience, new state-of-the-art studios, and location in the heart of the Broadway theater district in New York City make us the ultimate destination for dancers around the globe. Comprising more than 80 professionals, our faculty is fully committed to your development and training. You are sure to find a favorite teacher in this diverse group! Welcome to Broadway Dance Center! Located in the heart of the Theater District right next to the Al Hirschfeld Theater. Our 2,000 sq. ft. sprung floor with marley (welded seams-no tape!) is one of our largest studios. Sprung Hardwood Maple floor with upright piano and ballet barres in back of the room. Our column-free 1,400 sq. ft. sprung maple floor is a crowd pleaser with all of our students. Sprung Marley floor with upright piano and ballet barres. BDC also offers many other classes such as Pilates, AI Fexibility, Voice, African and Belly Dancing! Instructor Linda Farrell guides the class through her LindaFit®Pilates warm-up. With over 2,000 sq. ft. of dance space, this spacious studio is one of our largest. A skylight and theatrical lighting makes this 1,400 sq ft studio just makes you feel like dancin'! Sprung Hardwood Maple floor and huge windows overlooking 45th street. Get out your tap shoes...time to get those feet flapping and shuffling! 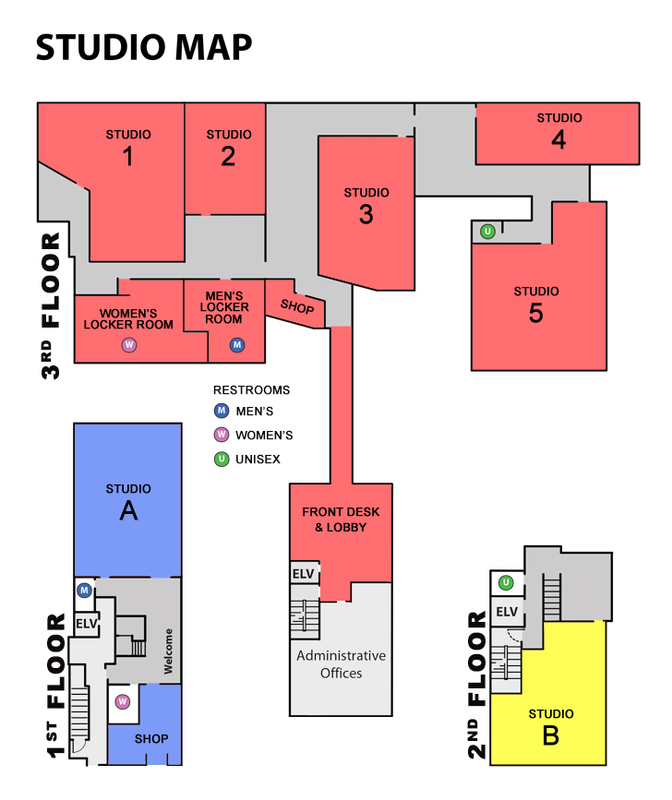 Broadway Dance Center occupies the first, second and third floors (over 30,000 sq ft) at 322 West 45th Street in the heart of Times Square.